We finally had a break from the crazy heat this weekend and I was able to comfortably wear a new sweater from J. Crew, so I was a happy girl! With the cool temps hovering in the low 60’s, I jumped at the opportunity to whip together a delicious Corn Chowder and Beer Bread to accompany the crisp, fall-like weather. I decided to post each of these recipes separately, because they are both pretty darn delish and I felt it would be unfair for them to share the spotlight. First up is a Beer Bread recipe, it’s a super simple and quick bread that will become a weeknight favorite to serve alongside all of your hearty fall meals. This bread literally takes five minutes to prep and requires only five simple ingredients. This bread will make you wonder why you ever purchased a beer bread mix because it’s just as fast and just as tasty. The sweetness of the bread compliments the subtle notes of the beer, but if you are not big on slightly sweetened breads, simply cut the sugar down to 1/4 cup. This bread is a great base recipe and has all kinds of jazzing up potential. Toss is a variety of herbs, cheeses, garlic, etc. or simply enjoy it as written. Stay tuned to MBA on Thursday for the Corn Chowder recipe…there’s bacon involved, so don’t miss it! 2. Butter an 8x4 inch loaf pan and set aside. In a large bowl, combine the flour, sugar, salt and beer; mix well. The mixture will be sticky. Pour into the loaf pan and bake for about 55 minutes. I have officially declared it autumn as well. I bought my first winter squash at the farmer’s market this weekend and I am super happy about it. If there’s one thing that screams fall to me it’s a good bowl of soup with a nice hunk of bread. You got the latter part DOWN. And I can’t wait to see about that soup! Thanks – looks great! Will have to give this a try! I’ve been making beer bread since moving to Colorado 25 years ago; of course here it’s called Coors Beer Bread! The weird thing is…I love it but not that fond of beer, so it’s not just for beer drinkers; it’s for bread eaters! I cleaned out my fridge today Jamie, found a bottle of beer my daughter must have bought…guess where it’s going, in about two minutes. Yep. And if that loaf is all gone tomorrow…well, luckily I can say it was all your fault! It seems as though we are on the same cooking/baking wavelength tonight between this and your amazing Cilantro Rice! Enjoy! So I compared our recipes; seems I had converted mine to using regular flour some time ago to avoid the substitution issue and mine has less sugar and more butter. Though yours is undoubtedly less fattening…that butter in the bottom of the pan that sort of cooks into the bottom crust? Not sure I could give that up! Either way…it’s a favorite and now, it’s all gone! I’m generally intimidated by baking bread, but your recipe, with only 5 ingredients, gives me hope! Of late I’m all about fewer ingredients with lots of good flavor, so this Beer Bread recipe falls right in line with what I’m attracted to these days in the kitchen. Thank you for sharing. For 1 cup, use 1 cup all-purpose flour plus 1 1/2 teaspoons baking powder and 1/8 teaspoon salt. Ahaha I love the idea of this bread! I’ve never had it before, but know I’d love it. Fall seems to have come early this year, and I can’t believe it’s time already for soups and sweaters! I’m definitely giving this bread a try this week! I’ve only had beer bread once from a mix I purchased and was a fan so I can’t wait to try it from scratch. Thanks for the inspiration! Jamie, I’ve never baked beer bread from scratch. I actually use a packaged mix from a food home business company. This actually looks easy. It chowders, soups and stew time, well not here in Atlanta, it’s still too hot, but real soon, LOL. Can’t wait to try this!!! I too had only bought the beer bread mix from you-know-who and loved it. But I have used the “scratch” recipe and it is every bit as good and much less expensive. Plus, I don’t have to miss out on baking beer bread just because I ran out of the mix. Try it, you’ll love it. P.S. I didn’t have self-rising flour so I googled what to add to all purpose flour and it worked out just fine. DELICIOUS! I’m a sucker for any easy recipe-love that your beer bread is five ingredients and a cinch to make! I love beer bread! *drool* I like to melt a stick of salted butter and pour it over the batter before baking, that way it has a really crunch, buttery crust. It’s so good! Hmmm – I can see why you wanted this bread to have it’s own time in the spotlight. It looks so delicious Jaime. Just printed that recipe out. It looks and sounds DELICIOUS! Looks good! I need to get around to making some bread this week… it’s definitely time. Can’t wait for the corn chowder, it’s my favorite soup. Oh how I adore beer bread! I’ve been making mine with cheddar cheese and jalepenos. TASTY! Can’t wait to see the recipe about the corn chowder. Bring on the cooler nights!! I made this last night using Blue Moon, which is by nature a pretty fruity beer. I liked it, but I think I’d make it with Bud or even a stout in future. It came together super quickly. I used 3 tablespoons of baking powder and 1/2 tsp of salt in the flour mixture since I didn’t have self rising flour on hand. It’s absolutely silly how easy, and how beautiful, this bread is! I love beer bread! What you can also do is after you pour the batter into the pan, melt 1/4 cup butter or margarine and pour that right on top of the batter then bake it. so crunch and…*drool* do i have any beer or flour? *looks* I’ll be jiggered i do! Hot Dog! This was amazing made two loaves. So simple and delish! Thanks for a simple wonderful tasting bread. Yummmmmmm I love beer bread!! What a great recipe! What size loaf pan? 8×4″ or 9×5″ ? I used an 8×4 inch pan. I’ll add that to the recipe…looks like I left it out. Thanks! I, too, love beer bread. Just had it over the weekend with spinach dip. I think my recipe has 1/2 stick salted butter melted over the top before baking. Creates a nice crispy exterior with soft bread in the middle. For a tex-mex flair, I add a can of diced green chilis and some cheddar cheese. Outstanding with chili and perfect for football games. Yum! I don’t even remember how I tripped over your blog, but if just for this recipe alone, I am so glad that I did!!! 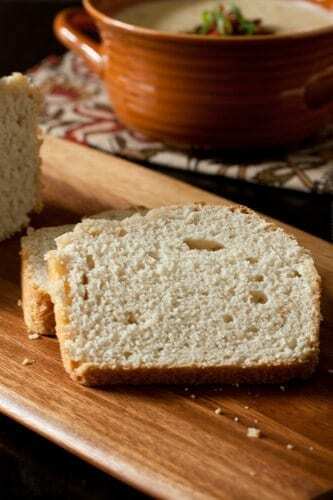 I LOVE beer bread, and those mixes are so expensive- I never would have thought that it was so easy and cheap to make. Thanks for sharing… I have been clicking around your site- great recipes… amazing photos! Tried this two weeks ago. LOVED IT. I cant wait to do it again with herbs this time. Wow, I was looking for a simple bread recipe and this is it! So quick and easy and completely delicious! yum, yum, yum! Thanks for sharing, my neighbor uses the packaged kind, and I’m looking forward to trying the homemade version! Wow, I’ve never heard of beer bread before (even packaged), but it looks/sounds delicious. I’ll have to try this out soon. This was my first attempt at beer bread. Mine didn’t turn out near as pretty, but it was sooooooo good! Plan on making another loaf tomorrow to take to dinner @ a friends, break it apart and serve with spinach & artichoke dip. Yummm! I think this bread with the corn chowder sounds amazing; I plan to make it for everyone tomorrow night for dinner. However I’m running through the ingredients I need to get from the store and came upon a question: is all pourpose flour the same as self rising? (the flour needed for the bread). All-purpose and self-rising are two different flours. Self-rising already has leavening agents incorporated into the flour. Hope this helps. Have a great day. Yum! This bread is so tasty! I had never heard of beer bread before one of my girlfriends made some from the boxed mix and of course I loved it! This recipe tastes just as good as any other I’ve had BUT it’s homemade and cheaper and SO easy! I went ahead and dumped the melted butter over the top of the batter prior to putting it in the oven as some other commenters suggested and it turned out really well! I also made my own “self-rising flour” as I didn’t have any on hand. I made this to go along with your Corn Chowder as you suggested and it was such a great meal. Thanks for another great keeper recipe! Just made this recipe for dinner tonight and it was FANTASTIC! I’ve tried several beer bread recipes and they all call for so much butter. I love that this doesn’t have tons of butter and the consistency is perfect! And my kids loved it too! Will be making this again, and again and again! So glad to hear you enjoyed the bread! Thanks for stopping by! I have a question. If I can’t come across self-rising flour, what do I do? I’ve seen a couple different comments on what to do, but they are very different in deed. One says all purpose flour plus 1 1/2 tsp baking powder and 1/8 tsp salt. The other says 3 tbsp baking powder and 1/2 tsp salt. Which do I use? I don’t want this bread to be bitter. Here’s is a conversion that I found online: 1 cup Unbleached All-Purpose Flour, 1 1/2 teaspoons baking powder, 1/4 teaspoon salt. I hope this helps. I made this bread last night with Yuengling and it was pretty tangy/sharp. I did cut down the sugar to 1/4 cup, but I didn’t expect it to be this tangy. Would cutting down the salt decrease this flavor? I usually use a lighter beer, but cutting back the sugar could have definitely attributed to the sharp flavor. Hope this helps. I always use half sparkling apple cider and half guinness beer. It gives it amazing flavor. I tried your recipe last night, and loved it! Why have I been buying beer bread mixes over the years? Thanks for sharing! I am so glad to hear that you enjoyed the recipe. Thanks for visiting the site and providing your feedback- Have a great day! I am so glad you enjoyed the recipe. Thanks for stopping by and providing your feedback – have a great day! I was going to make a beer bread recipe,one I found on another site, but didn’t have any so used 12 oz of hard cider – just called cider here in the UK – a brand called Thatchers. I added a tsp. of herbes de provence, 1 tsp. dried rosemary and a bit of dried thyme. 1 Tb of sugar only, 1 Tb of Baking powder to 3 cups white bread flour and 1 tsp salt. I added 1 cup shredded cheddar. The recipe suggested half a cup of cheddar and some additional parmesan but didn’t have any parm. I dotted butter on the top of the mixture before baking and it came out with a beautiful crust. It also made wonderful toast. I think I might try it with the parmesan and cheddar next as I would have welcomed more cheese flavour. Might also try more herbs or the peppers/jalapenos other people mentioned. I am very into savory things, more than sweet. 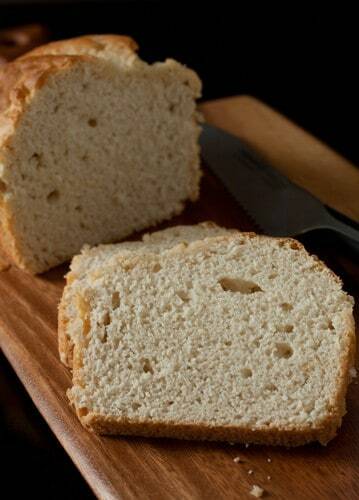 Great quick bread recipe. Always looking for something new and quick to fix. You should mention about not having to add yeast to this bread, because of the yeast in the beer already. However, in my different experimentations, I used Pyramid Hefeweizen from the west coast here in Seattle, because there is so much yeast caked in the bottom of the bottle (unfiltered), as opposed to domestic beers. Plus it gives it a little darker shade to the bread, as well as taste. Another good addition to the batter is jalepeno’s and parmesan cheese. Thanks again, and happy baking. I made this last night but have obviously done something wrong which seems ridiculous reading all of the comments about how easy it it. My crust was tough and the inside underbaked. Help. It tasted quite nice. Any idea what my problem might be? It could be that your oven temperature is off. You can get an oven thermometer at most hardware stores, making it easy to see if your oven is heating properly. I hope this helps. Great and easy recipe. I had self-rising flour in my pantry (I buy it only for beer bread! ), but my bread didn’t rise much at all. Wondering whether my flour is old and the leavening agents have lost some of their oomph. I probably should have written down the expiration date on my canister somehow.